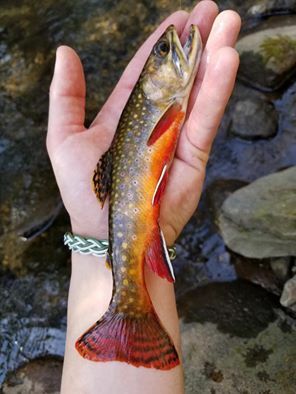 A guy I know caught this native a few days ago in a PA stream. Re: A rare native brookie! Wow and I mean wow! That is a one of a kind specimen. Thanks for the pic. pretty brookie, but just a brookie. I used to catch a lot of them on the broadhead some 20+ years ago. The colors always amazed me. Not a very hearty fish though, if they bleed a little when you unhook them, you might as well keep them cuz they will die anyway. I had to stop fishing one stretch of the river cuz it was loaded with them an it made me feel bad to catch them. That's one beautiful looking Brookie!